This is a compilation of tips and tricks I know for trading with support and resistance lines. The tips range from where to draw the lines, to how to confirm the lines, ways to trade and how to derive some targets. For more information on what, why and how support and resistance lines work check out my other articles on the subject. I have been using these lines for over a decade and can say, with confidence, that they are a very valuable tool for traders and one that should not be ignored. No other indicator can give you as precise a target for potential entries and exits. Support and resistance lines denote areas where traders are buying and selling stocks. When there are enough buyers to maintain or lift prices it said that the market is in support prices. When there are enough sellers to maintain or push prices lower than it is said that the market is resistant to higher prices. The interaction of these two forces is the fundamental driver of market action. Corporate data, economic data, news, expectations, fear and greed lead market participants to choose one side or the other and that is what we read in the charts. Time Frame – Time frame is an important aspect of support and resistance. Longer term support will be stronger than shorter term support, and also shorter term resistance. It is necessary to be aware of where these lines fall in higher time frames than what you are trading in order to avoid false signals. For example, a resistance line drawn from a chart of weekly prices will likely provide enough resistance to negate a signal taken from a chart of daily or hourly prices. You can avoid this by drawing lines on weekly charts in one color, daily in another and hourly in another. This way you can tell which lines are more or less likely to affect your trades once prices action reaches them. Long Lasting – Support and resistance lines are one of the longest lasting technical indicators and signal generators I know. Once drawn, these lines can provide target areas where signals can be found far into the future. Lines I have draw during reversals, continuations and break outs years in the past without fail affect price action in the future whenever price action returns to that level. This is an example of the underlying idea behind why support and resistance lines work. These lines mark price levels where buying or selling was heavy, or reversed, or consolidated. Once price action move on from this point the market is left split between losers and winners. When price action returns to the same level losers will want to get out and/or winners will want to get in. Look at the chart below. 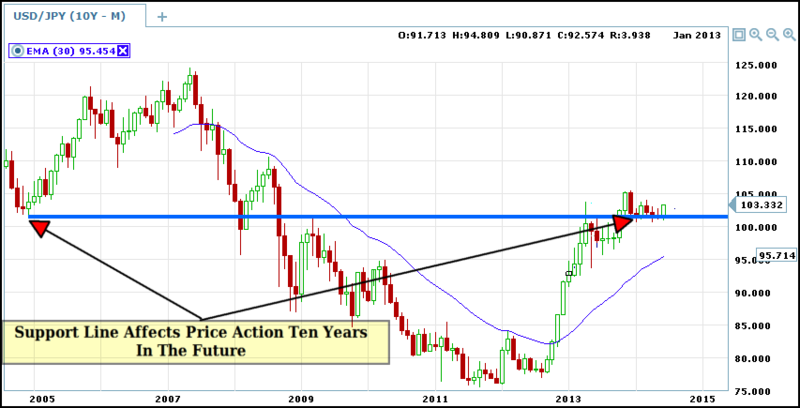 A support level established in 2004 affected prices 4 and 10 years in the future. Gaps And Windows – Gaps in price action, otherwise known as windows, are places on the chart where price action moves so rapidly as to create a gap between one day, or one candle, and the next. This can be caused by good or bad news of a wide variety but regardless of the cause, presents the same opportunities for trades. First, gaps and windows provide strong support and resistance. This is usually because the market moved so fast that many traders were left out. As prices retrace back to the gap level those traders who were left out of the move will scramble to get into the next one. Now, gaps provide not one, but two different levels of S/R; the upper and lower ledge, or window sill. In the case of an uptrend and up gap, the upper sill will provide support but if broken, the lower sill becomes the target. The same is true in reverse for down trends. I should also note here that most gaps will eventually close, that is, once price gaps up, sooner or later it will retrace all the way to the original price level. Fibonacci Retracements – Fibonacci Retracements are a great tool for finding support and resistance levels but also for confirming a support or resistance level. Not only that, depending on which retracement level is closest or coincident with your support/resistance line you can also make further predictions about price is heading. Reflexive Theory Of Support And Resistance – It is well known that support and resistance lines that have been broken will reverse in nature. This means that if prices are moving up and break through a known resistance level that resistance level then becomes support. When prices retrace to the break out level you can expect for buyers to step in. Why is this? Think about it like this; resistance is there because a large part of the market wants to sell, the breakout occurs because over time buyers over power the sellers. When prices move past this level they can move fast which can leave a lot of potential bulls out of the market, and also prevent bears from exiting at a price of their choosing. When prices retrace to the break out level it provides an additional exit for those on the loosing side of the line and an additional entry for those on the winning side. Look at the chart below, this is the same chart as above but with different annotations. 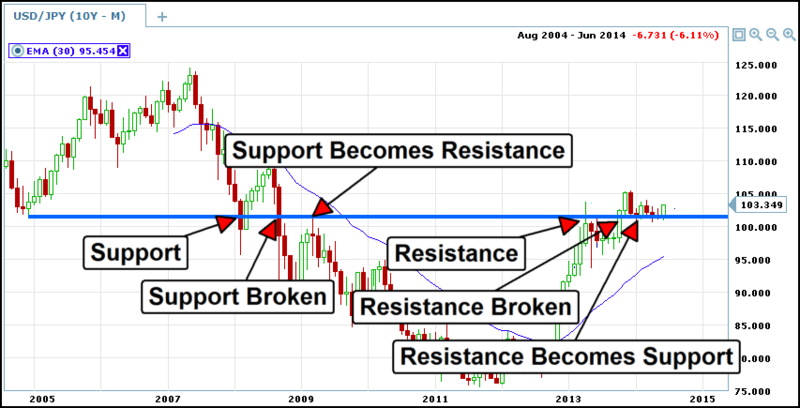 See how support held in 2008, then broke and then provided resistance in 2009. See how prices approached that same resistance line in 2013, were held back. See how that line was then broken in 2014 and became support.